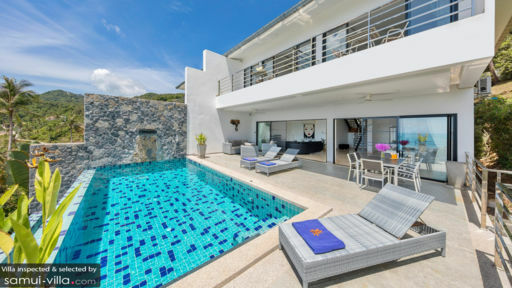 Villa Dove is found near the popular Chaweng district in Samui, which is home to the most popular night clubs, restaurants, and haunts among tourists. 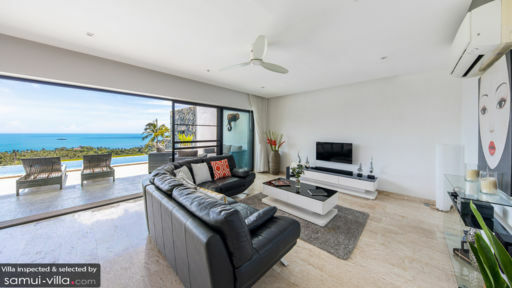 The villa is a modern property boasting shades of crisp whites and cool grey tones for a lively, homely, and cheerful ambiance. It is spread across two levels one of which hosts the infinity swimming pool offering excellent views of the beach and the stunning ocean. There are three bedrooms making this great for families and groups of friends alike. Steps leading upstairs will take you to the three luxurious and modern bedrooms at Villa Dove with their marble flooring, white walls, and private balconies. While two of the bedrooms are master suites furnished with king-sized beds, the third bedroom is furnished with single beds which can be together used as a family suite. 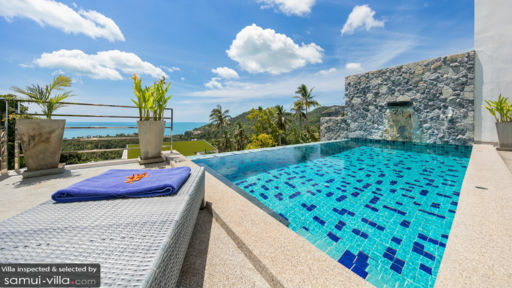 The master bedrooms offer views of the ocean and Chaweng beach, whereas the third bedroom offers a gorgeous view of the lush, tropical vegetation. There are en-suite bathrooms for all three bedrooms, with one bathroom fitted with a bathtub and a spectacular view, the other two having shower areas. The gorgeous blue-tiled infinity pool at Villa Dove is flanked by a rock-wall which has been fitted with a water fountain. Stunning panoramic sceneries make for a great theme that runs across the outdoor space as well as the living areas. There are deck chairs where guests can lounge and sunbathe or simply enjoy the peaceful ambiance. Just off the pool is the lavish and comfortable outdoor pool lounge which has been furnished with a sitting area and an alfresco dining area. Rest up on the cozy sofas or enjoy a meal out in the open air for a truly tropical experience. The outdoor lounge connects to the main living pavilion at the villa that can be accesses through massive, sliding glass doors that are also instrumental in providing a great view. The elegant, whitewashed space is remarkably furnished with white and black furniture and marble flooring. There is a plush, C-shaped couch facing a massive TV for your relaxation and enjoyment so you can have a wonderful time lounging without a care. The wall is decorated with a single, yet significant, piece of art to brighten up the room. Ceiling fans and air-conditioners keep the room cool and inviting. Apart from the sitting area, there is the all-white dining area with a six-seater dining table set against a mesmerising view outdoors. Finally, you have the western kitchen which is fully-equipped with excellent facilities and appliances including refrigerator, freezer, microwave, kettle for your absolute convenience. Villa Dove offers quality services to guests with the help of an entire team of people including the villa manager, the maintenance, maids, and security. On request, the chef is skilled in preparing delicious local and international fares for your delight. They can even make car and bike rental bookings on your behalf or arrange for in-house massages, laundry etc. The area around Villa Dove is great for travelers as it close to Chaweng beach, one of the most popular beaches in Samui. As you sunbathe, surf, or swim at the beach don’t forget to capture the moment with your cameras! Chaweng is famous for its bustling nightlife which is a great way to unwind, meet other travellers, and have a good time all the while watching a beautiful sunset!